"Three little kittens have lost their mittens.." is the song some knitters are singing on Ravelry. A popular fingerless mitts, wrist warmers pattern: Susies Reading Mitts has been archived as a free pattern. With over 5,000 projects for the fingerless mittens already, the lost pattern seems to have caused quite a clatter among knitters. 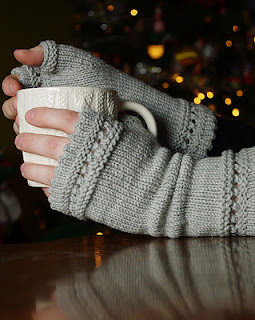 One resourceful knitter has found Susie's fingerless gloves at this link, which is still live. These Susie's Reading Mitts at the left are by AliceKathryn. You are quite welcome, I just made the Susies Reading Mitts in red for my granddaughter, so easy and quick, what a great pattern! Thanks for reading and Happy Holidays! thank you so much! I had bought the yarn and needles for this pattern only to find it was gone from Ravelry! You saved the day! Oh, you are quite welcome, just pure luck to have found it, happy knitting. You've saved me also! Thanks so much!! It's a collaborative effort...you are welcome! Thanks for reading. Adding my thanks also--I had used this lovely pattern for my daughter over a year ago, then came time for me to make my own and was so disappointed to find it gone from Ravelry. THANK YOU SOOOOOOOO MUCH! I already made one pair over a year ago and gave that pair away as a gift. Finally I had time to make a pair for myself and it was gone! Thank you a thousand times over! So happy to help, thanks for reading!